The person who composed this (more on the composition process below) was seriously confused about what active and passive clauses are: the text on the card is an active clause, and all the Yoda sentences I’ve seen are in fact active (though a fair number had no passive counterpart, because the verbs in them were intransitive, like the verb in #1). 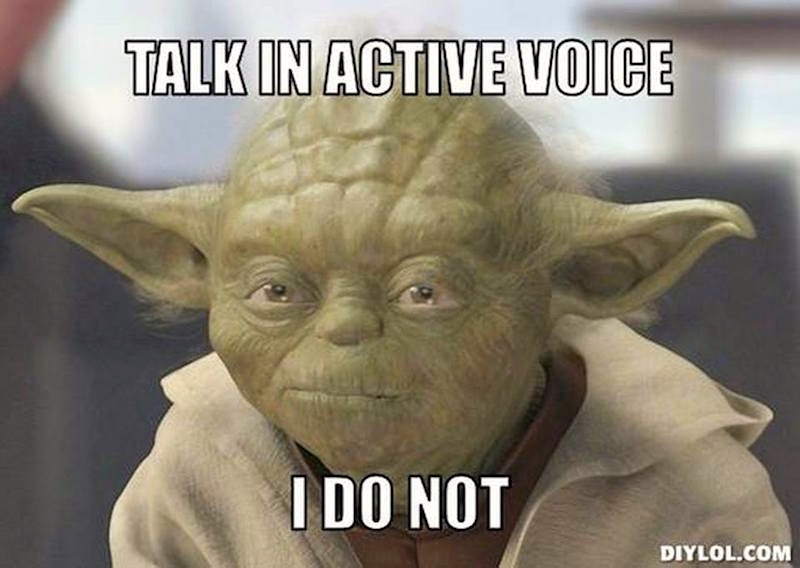 (A) Talk in active voice I do not. was a passive sentence because it had non-default syntax (from the point of view of standard English). But the syntax is non-default because of the fronting in it, not because of the status of the clause as active or passive. You are currently browsing the archives for the Active and passive category.